We are starting Paint and Sip nights. 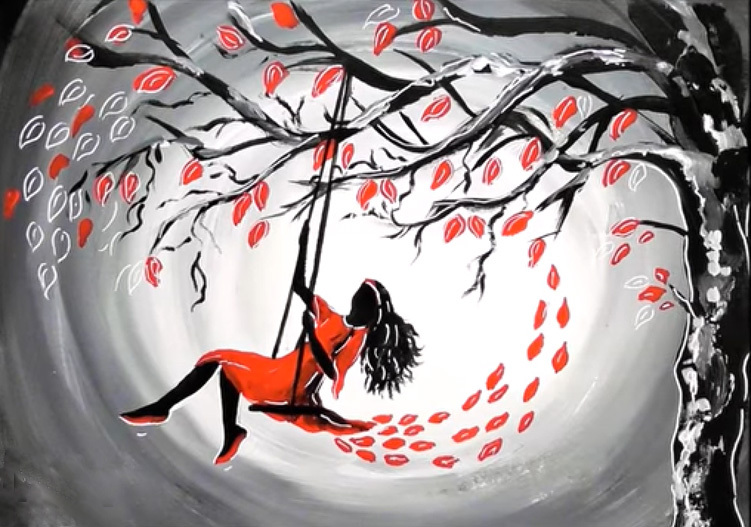 Come to one of our Paint Night Parties held in and around Milton Keynes in bars and restaurants. There, with a glass in one hand and a paintbrush in the other, you can produce your own personal masterpieces. The art on the right is Woman On A Swing by Vered Thalmeier. Go to Vered’s Youtube Channel to see more of her work. Welcome to the web site of Russell’s Oil Paintings, the site that shows the Bob Ross, Gary Jenkins and other style oil art paintings of Russell Collins, an Artist About Town living in Milton Keynes. Russell’s oil paintings are beautiful works of art that will add to the décor of your walls. All of the oil art shown here can be individualised for your own requirements, either by size, orientation or colour, I would be delighted to paint you a picture that meets your requirements. We now can provide an art framing service as well. We also hav up our painting workshops programme.. I am now preparing my painting workshops schedule for 2018. These workshops are suitable for all skills of painters from absolute novices to those who want to do something different. All materials are provided and at the end of the day you will take home your own personal masterpiece. I am going to be running a series of themes, and one of these themes will be the “Christmas Card” theme. Yu will be taken though a painting that you can use on your own personal Christmas Card. For more information on our painting workshops dates click here. We can now provide a high quality picture and art framing service. I now have my online shop where you the viewer can order my art in any number of formats, from simple prints through to wooden framed stretched canvases, acrylic reproductions and metal sheet reproductions. We can also supply our images on a number of different household items ranging from phone cases to T shirts and Tote Bags. All products have a full 30 day money back guarantee and ship within about 3 days of ordering. Click the shop link to visit the shop. We have a number of special offers there.